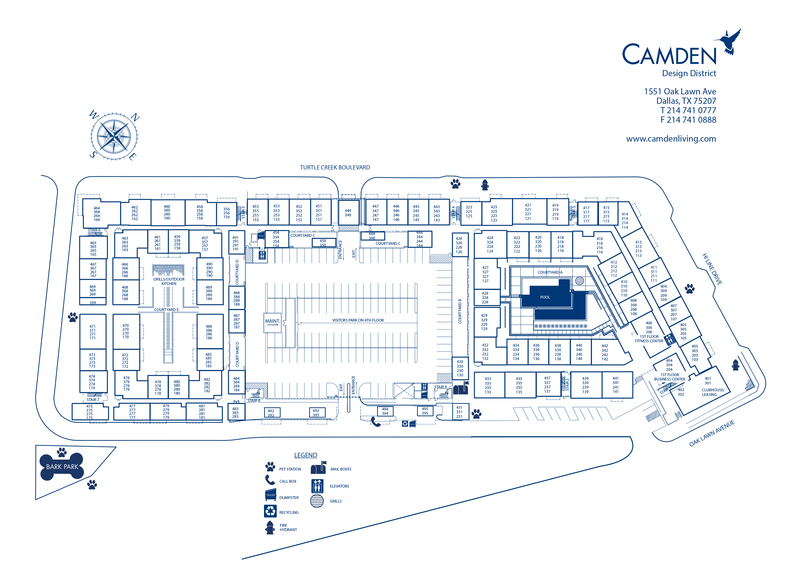 Camden Design District is a community of modern one and two bedroom apartment homes located in the Arts District of Dallas. We make it easy to dive into the culture of one of Dallas' most popular neighborhoods, where you'll be living within minutes of American Airlines Center, the Medical District, Klyde Warren Park and Katy Trail. Each open-concept floor plan features a contemporary, gourmet kitchen with granite countertops, subway tile backsplash, stainless steel appliances, chestnut cabinetry with nickel hardware, pull-down spray faucet and glass-top stove. Pendant and track lighting, full-size washers and dryers, programmable thermostats, ceiling fans and large walk-in closets provide convenience and comfort. And in select apartment homes, you will find high ceilings, stained concrete flooring and private balconies. Live a more balanced lifestyle of work, play and relaxation by taking advantage of the resort-style amenities. Surrounded by manicured greenery, the infiniti swimming pool with water features, sundeck and outdoor dining space is the perfect place to catch up with friends or work on a tan. Inside the 24-hour fitness center you'll find cardio equipment, free weights and towel service allowing you to create a different work out every day. And coming soon, the fitness center will be expanded to include a yoga and spin studio with on-demand virtual trainer! The newly remodeled, 2-story resident clubhouse has the perfect space to entertain friends and neighbors with a poker table, shuffleboard and bar. Find that coffee shop vibe just steps outside your front door in the WiFi lounge with comfortable seating, wireless printing and a gourmet, on-demand coffee bar. We love our residents' pets and want them to love it here too! The expansive, private dog park with an outdoor lounge is the perfect place to hang out and play. Living at Camden Design District also means the best shopping, the trendiest restaurants, and the hottest nightlife are all within minutes of your home. Discover your new neighborhood favorites in Downtown Dallas, Uptown and Deep Ellum, all just a short drive away. Our apartment homes are centrally located off I-35 and Dallas North Tollway and close to Dallas Love Field Airport. Cut the cord at Camden! Residents also receive a technology package included in the total monthly rent with a deep savings off retail. This money-saving package includes high-speed internet up to 200 Mbps x 200 Mbps plus local channels. With a high-speed, internet-only package residents can also subscribe to streaming or digital channel services of their choice. Come home to Camden Design District today and enjoy all that Dallas has to offer! At Camden, your pets are family too! We welcome cats and dogs, up to two pets per apartment home, with a full-grown maximum weight limit of 60 pounds each. Call us with any pet-related questions! We'll save a spot for you! We offer one parking permit per leaseholder in our direct access parking garage. We have ample parking for our residents and visitors in our 4 story parking garage on a first-come, first-served basis. Reserved parking is available to rent for $15 - $35 per month. Storage spaces are available to rent and range from $20-$85 per month.